Terri Lee Freeman is president of the National Civil Rights Museum. She is responsible for providing strategic leadership in furthering the museum’s mission as an educational and cultural institution. During her tenure, Terri has emphasized the connection between the historic civil rights era and today’s contemporary issues. 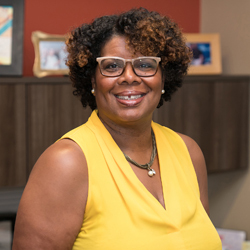 A graduate of the 2016 class of Leadership Memphis, she serves on several boards, including the Community Foundation for Greater Memphis, the New Memphis Institute, and the Memphis Visitors’ and Convention Bureau. She also serves as a member of the Tennessee Educational Equity Coalition Steering Committee. Terri received her bachelor’s degree in journalism/communication arts from the University of Dayton and her Master's degree in organizational communications from Howard University. She is married to Dr. Bowyer G. Freeman and is the proud mother of three daughters and has two grandchildren.